Justifide were a hard rock power-trio from Chandler, Arizona who after forming in 1999 went on to have major Christian music scene success with their first album with Ardent Records, 'Life Outside The Toybox', being nominated for a 2001 Dove Award. But by 2006 the group had disbanded so when the announcement came at the end of last year that Justifide were returning to the studio to complete some long-forgotten recordings that had gathered dust for years more than a few hard rock fans messaged the internet avowing their support. The band's guitarist Joey Avalos has been taken aback by the fans' support expressed for Justifide. He told breathecaste website, "People are really excited. We are doing this for the fans who really do care. It's not like we are getting back together and we are going to tour and do all this stuff. We won't be playing any shows. It's like a soft reunion. It's more of a big thank you." The history of Justifide goes back to when teenage brothers Jason and Sambo Moncivaiz began to play music in their home in Chandler. Their lives, however, were spiraling downwards with drug and alcohol abuse until the Christian conversion of their father led to the teenagers both experiencing God for themselves. 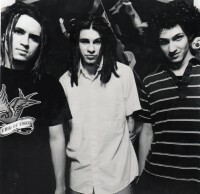 By 1998 a band called Justifide had been formed with Ian Metzger as the vocalist, Jason Moncivaiz on drums, Sambo Moncivaiz on the bass and Joey Avalos playing the guitar. Gigging around Arizona, within a year Justifide had recorded their first independent EP. Then Ian Metzger left the band and Jason started singing as well as playing the drums. They toured a bit as a three piece band, but eventually started hiring drummers to free up Jason for vocals. Some of the drummers they worked with were Jaren Johnston of The Cadillac 3, Jeff Irizarry of Dear Ephesus and Micah Schweinsberg of The Crabb Family and Crabb Revival. By 2001 Justifide signed with Ardent Records, the Memphis-based label offshoot of the legendary recording studio. 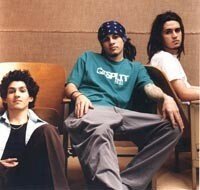 'Life Outside The Toybox' was a Christian rock music hit, Christian Retailing magazine commenting, "Heavy metal meets modern rock as brothers Jason and Sambo Moncivaiz join forces with Joey Avalos to deliver an aggressive sound that should appeal to fans of P.O.D., Creed, even Metallica, Pearl Jam or the Beastie Boys." A lot of touring followed and the following year Ardent released 'The Beauty Of The Unknown' album. The first single from the project was "To Live". Said Jason at the time, "That's us trying to get across to people what we believe, it's us trying to give people hope. It says that you can have a meaningful life, and have that void filled in your life. Nothing is going to fill that void apart from God." More heavy bouts of touring followed but eventually by 2005 Joey was feeling the strain. Sambo explained the situation recently to jesusfreakhideout website, "Joey was missing his family and wanting to settle down. He got married to his girlfriend shortly after that. And I think, stylistically too, because Joey had a pop rock band [called Stars Go Dim], and he's into a lot of different stuff. We were trying to work on songs for a new record, and Joey was just done, you know? Life on the road and everything; it was just kinda everything together. So, it was just time for him. It wasn't like he got kicked out or anything; he just decided he was ready for something else." The "something else" included a spell with Pillar before forming a management company, handling the affairs of several bands. Jason and Sambo formed a new band, Reform The Resistance, with drummer Ryan Dugger. With producer Malcolm Springer (Full Devil Jacket, Collective Soul) the new band cut the mini-album '.And It Begins' though it was to be five years before they recorded a full length album, 2011's 'The Truth Is Dangerous'. Jesusfreakhideout asked how the decision to reform Justifide came about. Explained Sambo, "We had stayed friends with Joey; he had done his different tours with Pillar, had another band on his own, but he settled into a manager role - he and Mike [Wittig] from Pillar have a management company now, managing bands. And so we would hang out with Joey and call him and talk to him and stuff, and he was always asking how Reform The Resistance is doing, and we'd be like, 'Uhhhhhhhhhh....'," Sambo laughed. "We were never business planners, we were just the music guys! And he would always ask us all these questions, and the answer was always 'Yeah, I really don't know. I don't have an answer for you.' Jason was talking to Joey, and, out of the blue, he said, 'Joey, why have you never asked to be our manager?!' And so Joey said, 'You know, I thought you guys would never ask!' So we decided to talk about it. Now, our commitment is 100 per cent Reform The Resistance; that's our focus. With Joey back in the picture, it's as the manager for Reform The Resistance. He said, 'You know, you guys lost a lot of contact with your Justifide fans.' He had stayed more in touch, because he was on the road with Pillar, and he was running across a lot of Justifide fans. So he told us he found some songs that we had been working on when he left the band. And he said, 'Now that I'm back with you guys, and we're working together, this would be a good opportunity to say thank you to all the Justifide fans, tell them about Reform The Resistance, and get them back into your lives.' Because, you know, the people that were coming out to the shows were as important as the music that we were making. With the ministry we have, we thought that was a purpose that God has for our band. And that has never stopped, even with Reform The Resistance." Continued Sambo, "We thought this was a way for us to continue the ministry and get back in touch with all the fans who may be excited to hear what would have been if Joey would have stayed in the band, and so it's kind of a win-win for everybody. But, that said, we are doing a fundraising campaign online through PledgeMusic, and we have four songs already done and recorded that we did with Joey when he was here and we were all together. We got in the studio and did those four songs [for an album to be called 'The Vault Sessions']. But [Justifide is] not our focus and priority. We're writing new music and - we're not old enough to have a reunion! We're still young guys! God has new things for us, and we're happy that we can go back to the past and reconnect with everybody. And so that's what this is really all about, just reconnecting with all those Justifide fans, and letting them know that we're still alive and still playing music, and hopefully it's a treat for them to hear some new Justifide stuff. I hope they like it! But that's kind of the extent of it. On the campaign, we have some incentives for a Justifide show. At this point, Joey is in band management, and that's his focus right now. We're finishing up a new record for Reform The Resistance [called 'Dos']." Sambo spoke about the material which will soon emerge on the 'The Vault Sessions' album: "Some of them were pretty close to being finished, and some of them were kinda just guitar riffs and they hadn't really been developed. It ranges from both extremes. The difficult part in the songs that weren't finished, they were over a decade ago - we're kinda like 'Man, we need to listen to old Justifide songs again' and try to get back into the mindset of what we were doing 12 or 13 years ago so that it sounds like Justifide still. That's gonna be the difficult thing. A couple of the songs had more ideas with them and lyrics written, so it's just a matter of giving them a proper recording." Sambo admitted that since the years of success with Justifide things have been difficult for him and his brother, but they have come to see God using their difficulties to bring a more mature attitude to their faith. He mused, "When we were young, it was almost as if we could do no wrong! We would write a song, everybody would love it, we would have a concert and everybody would ask for it, we were signed to a record label. We weren't worried about how we were gonna eat that night. The bills were being paid, we were having fun. And when we started dealing with some stuff - Joey leaving the band, getting dropped from our label, having a manager drop us, and then struggling again to have a fanbase to get people to listen our music - it was hard, and we really questioned whether God still had use for us. We said, 'God, we believe that you gave us talent and gifts, and we're working really hard on this. We've got no label, no managers, no tours, we're having to work other jobs just to fund ourselves. Aren't you blessing this? Aren't you blessing what we're trying to give to you?' And that was hard, man. That was really hard. "We had a buddy who produced the Reform The Resistance record for us, and we learned so much from him, and it cost us no money. From that point we really got inspired to do our own recording. Jason started interning at Gravity Studios in Chicago, kinda learning all the gear and the process. Before that, we were just musicians recording. We were never on the technical side. As soon as we started getting on the technical side of things, we grew a passion for that. And then we did our own record. Our last record we produced and engineered ourselves. We had no idea what God was gonna do with it, and we were just praying about it, 'God, we can't get a radio station to play us because we have no one to back it. We have nobody, but we're gonna have faith that, if you're gonna bless it, you're gonna bring people to us.' We didn't want to have to knock down doors for this. Jason said, 'What good is it if we have to beg people to listen to us? They're not gonna give us a fair chance anyway.' And so we prayed about it. A friend and the owner of Gravity Studios [Doug McBride] had been doing a lot of work mastering for a record label in Chicago called Wuli Records. They had told our friend at Gravity that they were looking to sign a rock band, and Doug had mastered our record, and he said, 'Well I've got some friends who have a rock band. Why don't you check it out?' So, before you know it, we got a call from Doug saying, 'Hey, I've got these buddies that have a label here in Chicago, and I gave them your record, and we'll see if anything comes from it!' That was an answer to prayer! How many bands have the labels call them? We got a call, and we thought, 'Praise God! He still has a plan and a use for us!' So I think we've seen a deepening of our faith and a realization that we are nothing without God. And we don't wanna do anything on our own. We're gonna be used by God, but we're not gonna beat down any doors. We are going to wait for God to open the doors, and we're gonna use the strength that God gives us to walk through those doors."